A large print edition of Jeffery Deaver's new James Bond novel Carte Blanche is released today by Thorndike Press. The enlarged print make this edition come in at a whopping 699 pages. What I like about collecting large print editions is they sometimes sport wildly different cover art. Many of the John Gardner books were released in large print with very interesting cover designs (check out this edition of Nobody Lives Forever). 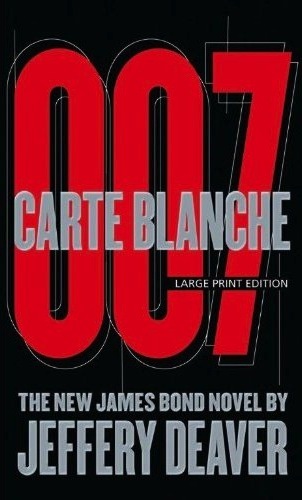 The large print edition of Carte Blanche by Jeffery Deaver can be purchased at Amazon.com .